By now you probably know that Pugsley was created to go where so-called “all terrain” bikes flounder. The floatation and traction afforded by large-volume, low-pressure tires can get you over and through otherwise un-rideable terrain…sand, mud, wet rocks and roots, ice and dense or packed snow. Pugsley is available as a frameset and as a complete bike. The frame will accept tires up to 3.8″ wide. 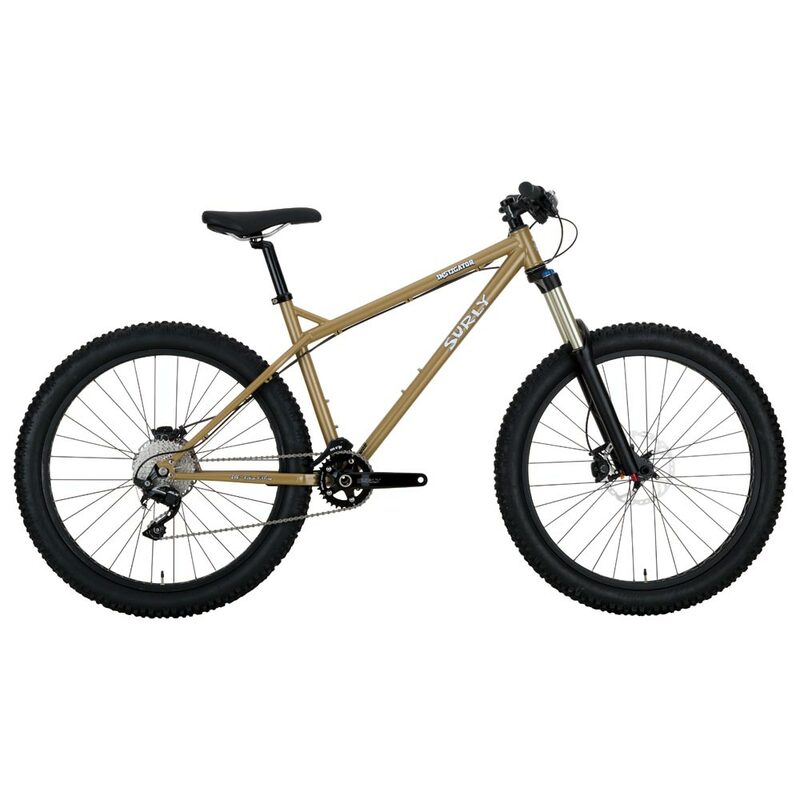 The fork is a 135mm-spaced symmetric version with extra cage mounts on each leg and room for a 4.8″ tire if you should choose to go even bigger up front. If you want to be able to swap front and rear wheels, get an offset Moonlander fork. This can be pretty handy in extreme temperature and physical conditions if, say, your freehub body were to seize up in the middle of nowhere at -50°F. 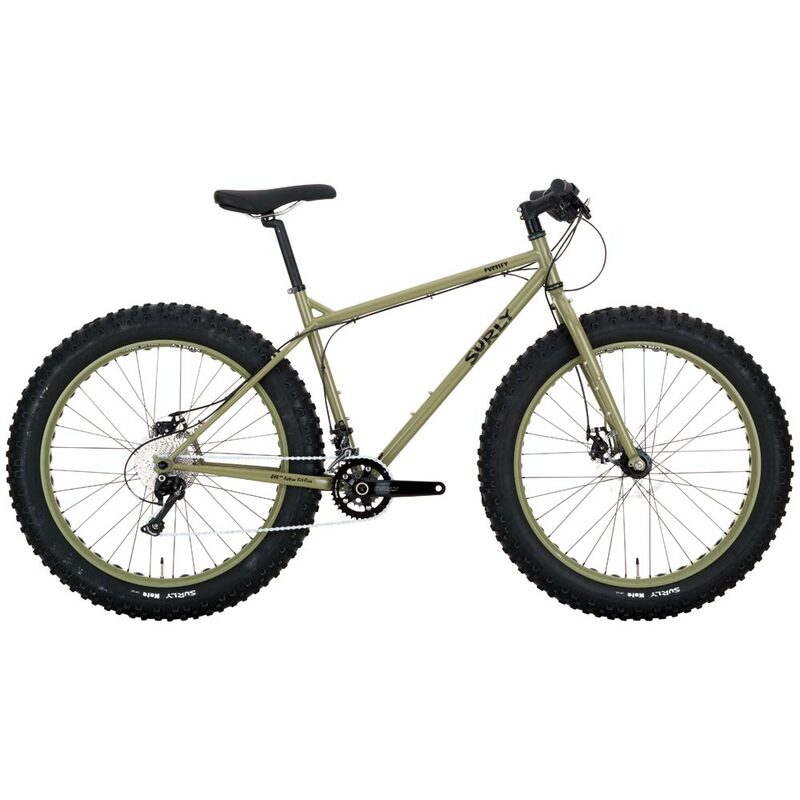 We won’t beat you over the head re-explaining the idea of the Pugsley or fat bike theory. If you’re looking at this bike there’s a good chance you already know what you’re looking at, and if you don’t then check out the Pugsley and Moonlander pages. There’s plenty of info there to get you up to speed. 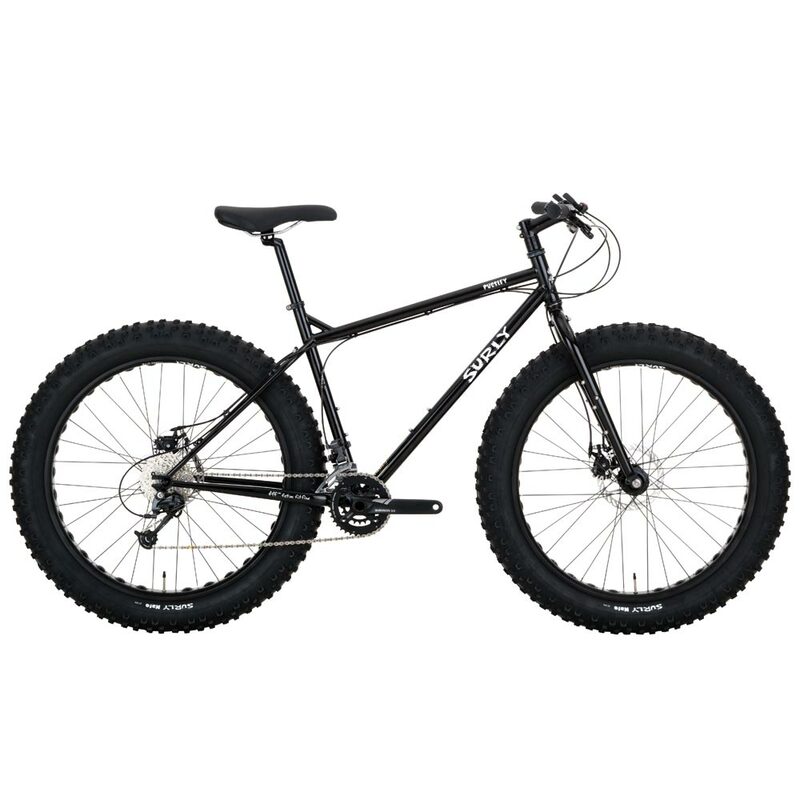 Pug Ops is a mid-fat fat bike. It shares the same frame as the standard Pugsley, and it has the same non-offset fork. The fork has clearance for 4.8″ tires on 100mm rims, it’s spaced for 135mm hubs and has cage-mounting bosses on each leg for running either standard bottle cages in a high or low position or a larger gear cage. Surly Moonlander runs 4.8: tires on 100mm rims. Such a large footprint allows you to ride them at very low pressure, which (as with a snowshoe) enables unparalleled traction and float over all kinds of terrain…wet stuff, roots, rocks, pebbles, gravel, sand, and many types of snow. Moonlander, like its name implies, is meant to go beyond where normal bikes, even normal fat bikes, can go. It is designed from the ground up to ride where there are no roads, no trails and no people. Like all of our framesets, Moonlander is made of 4130 cro-moly steel, with tubing designed specifically for this frame. The frame’s geometry is not unlike a standard mountain bike, with a bottom bracket height that supplies plenty of clearance for bushwhacking and monster-trucking while remaining low enough for a stable ride. The toptube maximizes standover height while keeping the headtube fairly high so you can set up your rig with a comfortable, all-day-grind riding position. We offer the Moonlander as a complete bike, with components chosen for their durability and their suitability to the task at hand. Parts include our own strong, light Clown Shoe rims and gnarly Bud and Lou tires. It also comes with our O.D. crank, which supplies plenty of room for the fat shoes while supplying all the gears you need to crawl through muck and fly down hills. Moonlander is also available as a frameset if you would rather kit it out yourself. Frame sizes range from Small (16″) to XLL (22″ Extra Long). 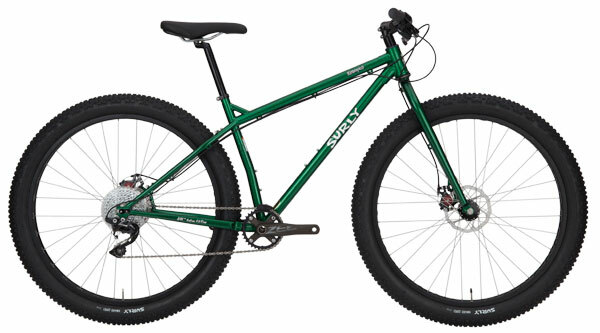 The Krampus marries the tricky terrain fat bike style of Surly’s Pugsley and Moonlander, with the nippiness and nimble handling of a much racier MTB. Some may remember a discontinued Surly model called the Instigator. The Instigator was a burly hardtail made for going fast and going big. The new Instigator picks up where that one left off. This thing is made from the ground up to swoop, rail, hammer, drift, carve and fly. It goes downhill like nobody’s business and climbs well too. It takes standard 34mm headsets and regular mountain bike hubs (100mm front and 135mm rear). It’s designed for full length housing to keep out the elements and keep brakes braking and shifters shifting on long treks in rough conditions. The rigid fork can be swapped out for an 80mm suspension fork if you like, but this would mean you’d lose the extra carrying capacity of the stock fork, and you couldn’t run a 3” tire and 50mm rim.